If there ever is a day when you shouldn’t look simple, it is your wedding day! As the bride, all eyes will be on you. While the elegance of a white wedding gown is unbeatable, you can still enhance your wedding day look and look more glamorous than ever before. Here are the various options you can consider, to make this possible. A fitted silhouette that snugly embraces your curves is beautiful, and certain silhouettes easily accentuate the WOW Factor. If you can carry off a mermaid dress with style, you gain extra points. Other features that can be stunning on a dress include a daringly low back or an illusion back with beautiful details. When choosing your dress, pay attention to the features at the back as well. After all, your guests will catch a clear view of it during the ceremony and you want to impress from all angles. Necklines can add a dose of glamour too, when done right. Sweetheart bodices, deep cut V-necklines or scintillating halter straps are all excellent choices for stepping up your style. With metal beading, crystal embellishments, rhinestone work and shimmery lace, you have so many choices. 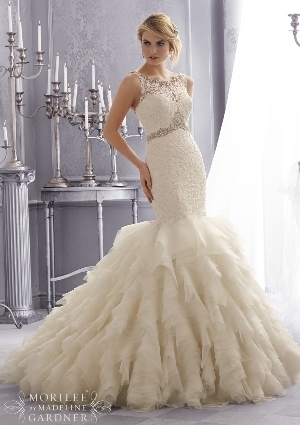 Don’t hesitate to choose a wedding dress that is a masterpiece of embellished details. Forget simplicity, choose a dress with as many details as you can afford to wear without drowning in it. For a cool, sophisticated and timeless look that is glamorous as well, opt for a wedding gown in Larissa satin or Duchess satin, and the subtle sheen will add a touch of luxury to your overall look. If you have second thoughts about choosing a dress that is way too simple, do not worry. You can add sparkle to your outfit with matching accessories that are big and bold, and compensate for an understated wedding gown. Pick a pair of chandelier earrings, add a tiara, or choose a fantastic necklace to add more style. You needn’t even stick to silver or white. Choose colored gemstones or gold as the metal for your accessories for an expensive and trendy look. Step up your style quotient by adding a scintillating statement waistband. This will also draw attention to your slender waist, and help you show it off. For a winter wedding, wear a fur cape or stole to add more style. Don’t forget your wedding shoes either. Make sure they complement your dress beautifully, while also fashionably dressing up your feet. A change in your hairstyle will make it more noticeable. Do your research well, and decide on an interesting hairstyle that will add an extra dose of glamour to your overall look. Dress it up with a shiny hairpiece, or a complex flower arrangement. Experiment by placing your hairpiece in different positions on your crown, till you find the best one. You are now ready to step out and seize the stage! Whether you want a fantastic wedding gown or beautiful accessories for your big day, visit us on Best for Bride and we will provide you the solution! I like the idea of using bold jewelry to bring out the dress. Great tips here! I would say that making my wedding dress stand out even more would be a mistake. I can see how some of the plain ones, might need a little help with accessories! It is not easy planning a wedding, but I must say that we you have blogs like this one. it is a must! I am a huge fan of jewerly. I liked to put my eyes on that, or they want you to take out the reset. What great ideas for something that is so helpful! As usual, you have provided tips so that I can feel comfortable about getting married. I think if you are not going to have a long, elegant wedding dress, having some nice big jewelry is a perfect idea!